This recordings by the Jackson, Mississippi-based brother, sister, and brother team of Cliff, Ed and Barbara Thomas appeared in the second mailing of PI releases (the first five singles had gone out together four months earlier). Wisely, Sam Phillips waited until much of the reaction to Bill Justis' "Raunchy" had died down before releasing this efforts. Its hard to know whether Sun had a national market in mind when these sides were shipped. Like Ricky Nelson, the Thomasses had a TV show (although they didn't go coast-to-coast) and were guaranteed intense exposure for teen heartthrob Cliff. A casual glance at the wholesome Thomas siblings gathered around the piano is not going to trigger the same response as watching Gene Vincent and the Bluecaps, but the truth is that Cliff, Ed and Barbara made some surprisingly good music. If nothing else, they were listening to (and absorbing) the right sources. But unlike their labelmate Johnny Carroll, they were not borrowing them literally. On second thought, maybe PI was going to specialize in artists whose last name started with "P". Pittman, Powers and now Pinky. Actually, that's Pinkney, although his handle was surgically shortened to Pinky. In any case, Pinky was the first black artist who had graced a Sun microphone in quite a while. In fact, other than Rosco Gordon (who would enjoy another Sun release later in 1958), the place was starting to look as lillywhite as a Klan meeting. But Pinky changed all that. "Sally's Got A Sister" is a slightly different matter. Although it doesn't quite know what it wants to be or, more aptly, how to get there, there is a very interesting record buried in here. The verses (more references to "Long Tall Sally" and company) are trite enough to make you sit back and pay attention when the release (containing the title) finally arrives. This songs works! Then there's the business of the instrumental break: not one, but two. After Bill Justis has his way say and we're expecting Pinkney and the Turks to come back in with the hook-aden release again, we're treated to 12 more bars of jamming, this time by Roland Janes. A strange record indeed. 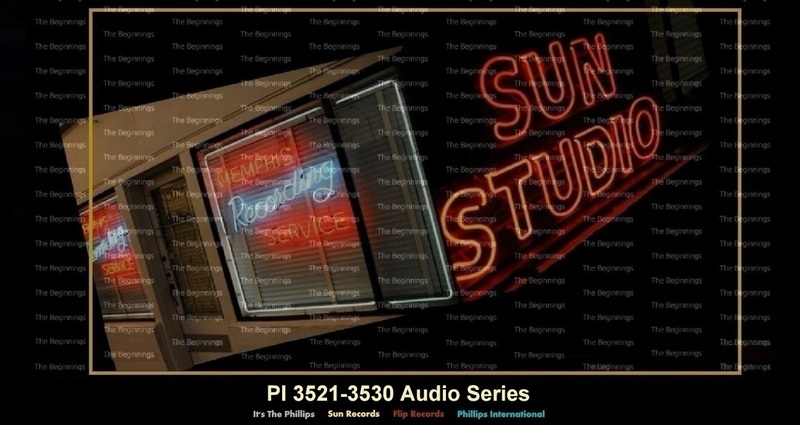 By all account, Ernie Barton virtually lived in the Sun studio between 1957 and 1960. He recorded as vocalist and session guitarist and even took over management of the studio for a while. He was, to put it mildly, a fixture. There were actually plans for a Barton LP - a step that now seems fanciful given the fact that (1) Sam Phillips was uncomfortable with long playing records at the best of times (Cash, Perkins and Lewis being the best of times), and (2) Ernie Barton never had anything resembling a hit single on Sun Records. All of his studio activity resulted in the grand total of two releases on Phillips International. This atmospheric composition formed the topside of his first single and came from songwriter Allen Wingate, who was recording at the time as Allen Page for the local Moon label. The Bill Justis Orchestra (not band) were back for their third release in four months. Never in the history of Sun Records had so many releases by a single artist appeared on the market in such a short time. The reason here was quite obviously the need to capitalize on the success of "Raunchy". Neither of two previous followups had managed the lofty sales figures or media attention of the original, and Sam Phillips didn't want to let this one get away from him. "I was born in Columbus, Georgia, in 1936. Grover C. Mitchell is my real name. I worked sideshows in Fort Benning, Georgia, national Guard Armories, skating rinks... that sort of thing. I played drums and sing. I had a good feel for making up songs, and I'd sing 'em on the bandstand right after I'd made 'em up. If the people liked 'em, I'd go home and write down the lyrics. "Blue Bird" was recorded at WRBL-TV Columbus by Ben Parsons, who ran a talent programma and was on radio too. We used a vocal group from Phoenix City, Alabama, the Charmettes, who were twelve, thirteen and fourteen year old. I had a manager then, Bob Helms. You can jerk a manager out of the bushes if it looks like you're gonna make it, and this guy latched onto me''. ''He worked for Dixie Distributing and he took the master to Sam Phillips and Sam liked it. Helms never done anything else for me, though. I got a lot of bad advice. I still got a lot of stuff lingering out there in the dark somewhere". "After Sun, I recorded for some hometown outfits. Got a lot of records out on Curley Money's Rambler Records. I wrote some more songs. All the time I was working in a steel mill in Atlanta, but I'm retired now".